This September my surface design group made floor mats. We gathered over two days to paint our canvas. I got the painting done but then there it sat of months. I needed to do many coats of sealer and then hem and glue down the edges to finish it. I got it done. It measures something like 24" by 32". 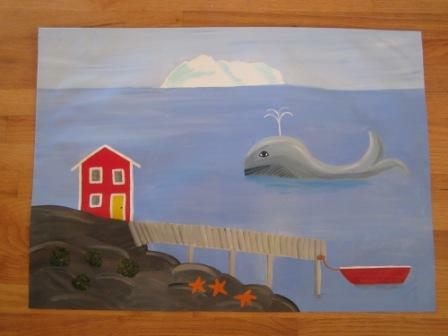 I wanted to make a Newfoundland sea scape because of my Newfoundland background and the trips I have made to Newfoundland. 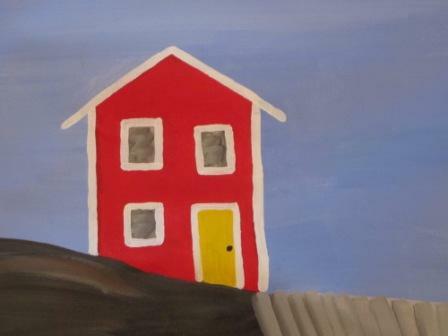 I love the art work of the Newfoundland artists over at The Grumpy Goat. They have a great Blog to follow along. I first was their work at the Newfoundland Craft council back in June of 2008 while in St John's. My maiden name is Manuel and my Grandfather was from Exploits Newfoundland. Newfoundland and Exploits has a special place in my heart. I wanted to make a floor mat that was in the style of the Grumpy Goat Artist's. I love the bright colours and the whimsy style. I do not have all the detail and professionally look they put into their work. 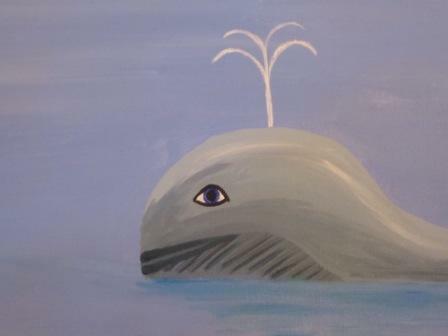 My whale with a spout. I am not sure what kind of whales you could see off the shores of Newfoundland. We did not see any. I have seen many Humpback Whales in Hawaii and Ocra Whales off shore of Victoria BC. Other memories I have of my trip to Exploits were picking mussels on low tide to have for dinner. Harvesting some ice burg ice for our scotch just before dinner. Walking the grassy path on the east Island of Exploits. Uncovering the head stones of family members. 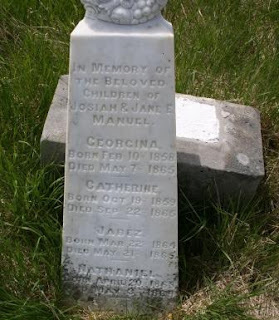 One little girl died at age five and we share the same name, she was my Great Great Grandfather's daughter. They had 11 children and only four lived to be adults. We found Great Great Grandfather and Grandmothers head stone too. In June of 2008 we saw many Icebergs. 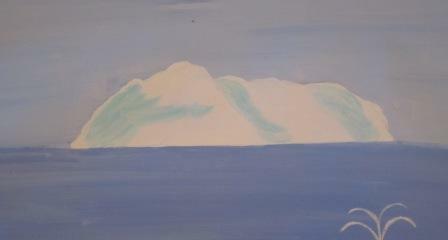 There was a great sized one at the opening of the Exploits Bay so my sea scape was getting a iceberg. Here is Catherine's Head stone with some of her siblings. Some were also on the side panels. Here is one photo of the iceberg outside the Exploits harbour in June of 2008. Can you see the Viking face in the ice. Helmet and nose and the long beard. I totally see the viking! Talk about your awesome abstract inspiration... You know how kids on the prairies lie on their back and see pictures in the cloud formations? I wonder if Newf kids do this with icebergs? It's absolutely beautiful!!! I LOVE it! I especially love the whale...it looks like a humpback! 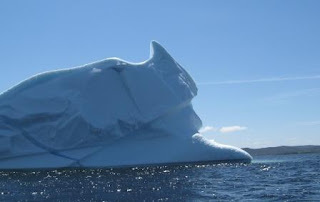 You might not have seen whales when you were here, but that is the neatest iceberg since time began! Beautiful floor cloth and so enjoyed reading your story.